The coming of recombinant DNA technologies in the 1970s initiated a new understanding of cellular processes and genetic diseases. However, limited applicability in primary cells and whole organisms trapped researchers as readers and not writers of genetic processes. The recent discovery and application of the Clustered Regularly Interspaced Short Palindromic Repeats (CRISPR)-Cas9 system as a potent method of inducing targeted DNA breaks opened unprecedented venues in the field of genome engineering. From inactivating genes, to correcting mutations, to deleting, inverting, and translocating large chromosomal fragments, CRISPR-Cas9 technology has even expanded towards whole-transcriptome and -epigenome control. Through these methods, integrated approaches now allow the precise recapitulation of complex genetic diseases, and subsequent probing for their weaknesses. With the assumption that a comprehensive understanding is the crucial basis for finding a cure, we apply multiplexed CRISPR-Cas9 genome engineering to model the genetic landscape of leukemia. Major efforts in cancer genome sequencing have yielded deep insights both into the overall mutation burden and the sequence of acquisition. However, the mechanisms through which diverse mutational patterns orchestrate leukemic transformation remain elusive. Thus, tackling these open questions with in vitro and in vivo based CRISPR-Cas9 cooperation screens is the focus of several projects. In combination with whole-transcriptome analyses and synthetic-lethality drop-out screens, these studies will advance our understanding of the genetic interplay in leukemia towards better treatment options. A distinguishing feature of pediatric AMLs compared to AML in adults is the remarkably high incidence of chromosomal rearrangements, which result in the expression of fusion oncogenes and a simultaneous loss of healthy genes. 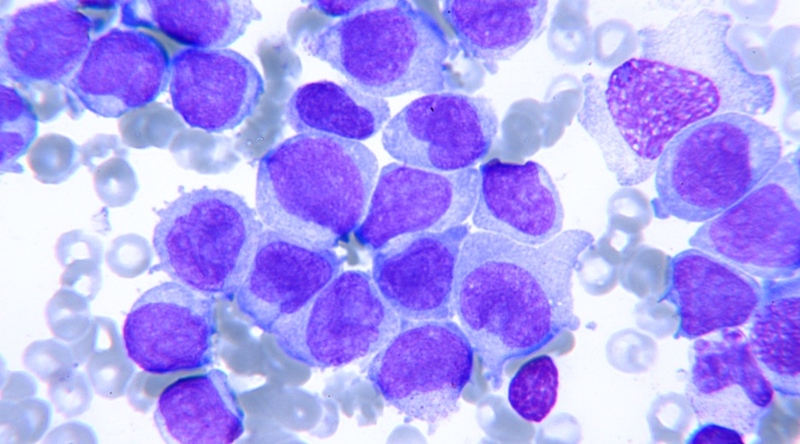 In particular, acute megakaryoblastic leukemias (AMKL, AML-M7) display a pattern of chromosomal translocations that do not occur in adults or other subtypes of pediatric AML, indicating the impact of these translocations on disease phenotype and progression. However, the molecular nature of this impact has remained uncharacterized thus far. Using CRISPR-Cas9 genome engineering, we have successfully generated chromosomal translocations in hematopoietic stem cells: the target population for leukemic transformation. This model allows us to interrogate the cellular and molecular consequences of specific translocations. In future studies, we will leverage this knowledge to explore possible weaknesses of AMKL, and develop advanced treatment strategies. Refined sgRNA efficacy prediction improves large- and small-scale CRISPR-Cas9 applications. Labuhn L, Adams FF, Ng M, Knöß S, Schambach A, Charpentier EM, Schwarzer A, Mateo JL, Klusmann JH, Heckl D.
Nucleic Acids Research. 2017 Dec 18;gkx1268. doi: 10.1093/nar/gkx1268. Gene correction of HAX1 reversed Kostmann disease phenotype in patient-specific induced pluripotent stem cells. Pittermann E, Lachmann N, MacLean G, Emmrich S, Ackermann M, Göhring G, Schlegelberger B, Welte K, Schambach A, Heckl D, Orkin SH, Cantz T, Klusmann JH. Blood Advances. 2017 Jun 6;1(14):903-14. doi: 10.1182/bloodadvances.2016003798. CRISPR-Cas9-induced t(11;19)/MLL-ENL translocations initiate leukemia in human hematopoietic progenitor cells in vivo. Reimer J, Knoess S, Labuhn M, Charpentier EM, Göhring G, Schlegelberger B, Klusmann JH, Heckl D.
Haematologica. 2017 Jun 6;pii:haematol.2017.164046. doi: 10.3324/haematol.2017.164046. Generation of mouse models of myeloid malignancy with combinatorial genetic lesions using CRISPR-Cas9 genome editing. Heckl D, Kowalczyk MS, Yudovich D, Belizaire R, Puram RV, McConkey ME, Thielke A, Aster JC, Regev A, Ebert BL. Nat Biotechnol. 2014 Jun 22;32(9):941-6. doi: 10.1038/nbt.2951.